Mauro played with keys on an old piano in rooms he rented to us a stone’s throw from the Campo dei Fiori as he peered at the tourist map we’d brought along. The map’s folded sections made the city easier for us to digest: the Vatican on one page, the Trastavere on another, and so on. We stood nervously, trying in our fug of jetlag to blend in with the ancient beams and fixtures. We were neophytes in an old city, and it was more than obvious that we had just disturbed the gods. This vision of Mauro swam into my head the other day. I couldn’t quite put my finger on it, but something was bugging me. Every time my chanterelle photo popped out at me, it made me feel uneasy. And then I got the connection. I drew myself to my full height. ‘These,’ I said contemptuously, imitating Mauro and swatting at my monitor, ‘are not my chanterelles.’ I patted my chest, and turned my gaze inward as sternly as I could muster. And so I pulled out my weatherworn hiking boots, set my sights on the low mountains in the distance, and headed off to happy hunting grounds. While I’m totally fine admitting that the chanterelles I bought a week or so ago were pretty darned tasty, the chanterelles I came back with from the woods the other day were all that much fresher and considerably more yellow than the ones I used in my last chanterelle recipe. And more satisfying. Coupled with the thrill of the hunt – still heavy in my memory – I derive real pride in calling them my own. 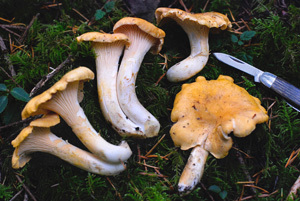 Here’s a recipe that marries Pacific Northwest Chanterelles with Mauro’s Italy. I’m pretty sure even he would approve. Buon appetito! 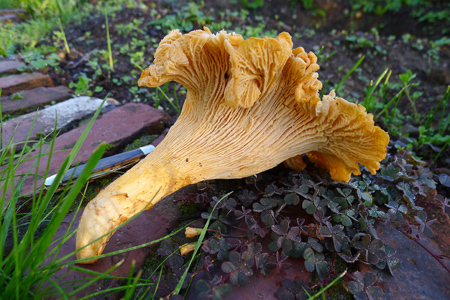 Prepare the chanterelles: With a brush, clean chanterelles of all dirt and pine needles. You can use a dab of water to clean the tops, but never soak the gills or lower stems of chanterelles or they’ll become mushy. 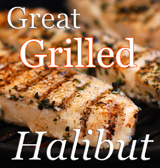 Heat a Tablespoon of butter and 2 teaspoons of oil in a 10” frying or sauté pan over medium heat. Pull pieces from the top of each mushroom to remove the flesh in strands. Break small mushrooms in half and leave tiny ones intact. Cut long strands in half as desired. Add the pieces to the hot oil and sauté for 5 minutes, until just cooked through. 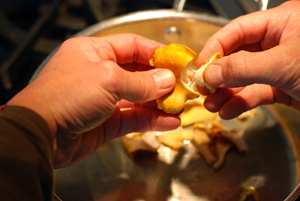 Remove chanterelle pieces to a plate, and pour the cooking juices into a small bowl or ramekin. Heat the stock: You can use clear veggie stock for this, or make some with a dessert spoon of ‘Better than Bouillon’ and boiling water. Heat the stock to a simmer, add the juice from the chanterelles and keep hot. It is critical for good risotto that the stock be hot when it’s added or the rice won’t cook properly. Make the risotto: In a large frying or sauté pan, heat another Tablespoon of butter and 2 teaspoons of oil. Sauté the chopped onion for 4 or 5 minutes on medium heat until it begins to go translucent. Stir the rice into the onion and oil until it’s well coated (not longer than a minute) and add the white wine. Set the burner on medium low as the wine becomes absorbed. Lift the rice from the bottom with a spatula and turn it over as you would a pancake. From this point, it is essential to time the cooking of the rice. Carnaroli cooks to al dente in 16 minutes from this point; Arborio, depending on quality, takes 1-3 minutes longer. Add a half cup of hot broth and stir so that the broth reaches the bottom of the pan. Once it gets absorbed, add another half cup. Stir occasionally but don’t overdo it. Do one more addition of stock and then, when only a couple of minutes are left you need to gauge how much more to add. Too much will make it soupy and not enough will make it stiff. With a minute left to go, add most of the chanterelle pieces, saving back a few choice pieces for a garnish. Stir in the cheese and grind on a little black pepper. Remove from the heat. To table, to table: Divide the risotto among 3 or 4 heated bowls or plates. Top with a bit of extra parmesan and garnish with a few choice pieces of chanterelle (heated again quickly if necessary). Drizzle with truffle oil, if available. Bring the risotto to the table hot, and watch the smiles light up the room. A little bit of Italy with handpicked bounty from the local woods. It’s all good here! A granddaddy of a chanterelle: 6 ounces! I love chanterelles! This risotto looks amazing! 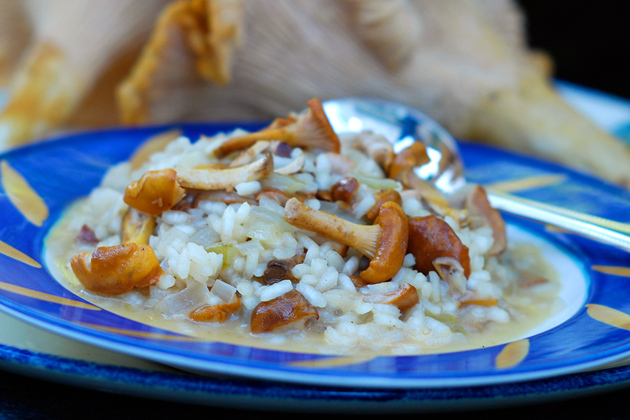 Mushroom risotto is one of my all-time faves! This looks delicious! Fantastic! Anything with fresh wild mushrooms is fine by me! Oooo! this is mouth watering good! Incredibly lovely mushroom! Stunning photography! mmm, this looks amazing! 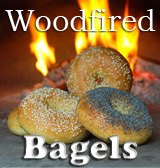 great combination of ingredients.